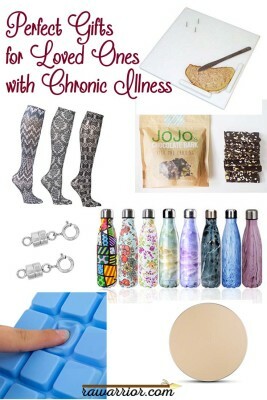 RA Warrior already has a popular gift guide: 21 Gifts for People with Rheumatoid Arthritis. But in the past couple of years, I’ve found and tried so many new things—several given to me by loved ones! So I’m choosing some of the best ones to recommend to you in this new gifts for chronic illness guide. Of course, people with chronic and painful illnesses like many of the same gifts as everyone else. But a gift that meets a particular need can show that someone cares—or understands what a loved one is going through. 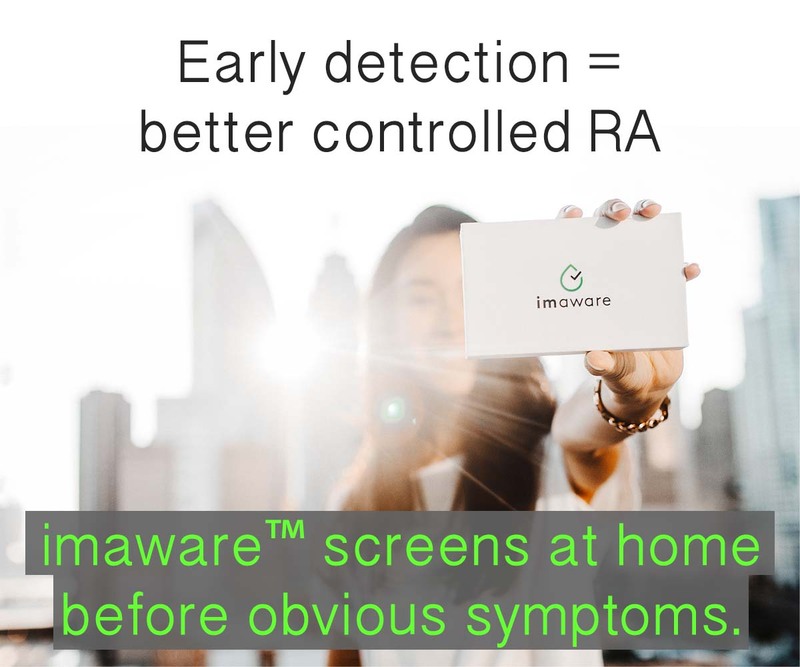 Don’t assume a person with a disease like RA / RD can use exactly the same tools that everyone else uses. It doesn’t have to cost much to show thoughtfulness—you can always do a difficult chore when a loved one with chronic illness is not home, drive them to an appointment and stop for a lunch out, or prepay a hired hand to help out. 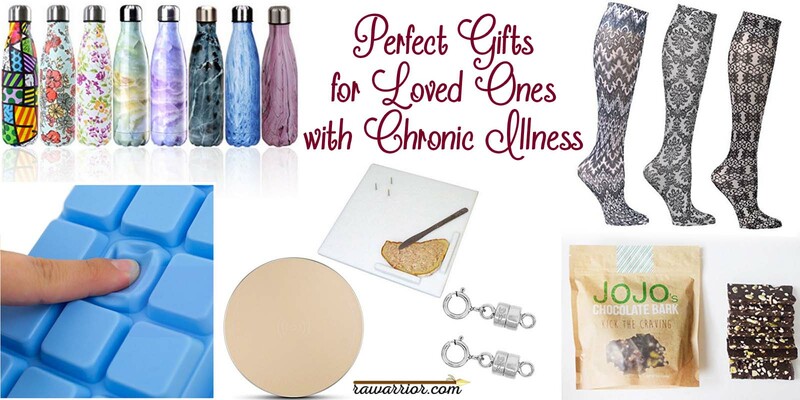 Here are some more tips to help you choose gifts for chronic illness sufferers that they will love. Pick the lightest one: From clothing to cups to wallets to scarves to phone cases, even a couple of ounces can make a difference. Notice something that’s difficult for them to do now. Search for a solution—something you can do or order on Amazon. Avoid easy-sounding answers—like books with the words “easy” or “cure” in the title. Most likely these easy “solutions” have been tried already and found wanting. When my daughter gave me a cordless charger, I did think it was a bit extravagant, but it makes my life so much easier. My fingers hardly ever need to struggle to use the tiny plug. There are many universal charging pads now that work with all brands of phones and tablets. 2. Funky pull can opener. I love this piece of bent plastic! It has empowered me to open things I’d given up on. I keep finding new uses for it—it works on the tough plastic ring inside a creamer bottle. These were a brilliant gift that allowed me to make ice again. No twisting. Turn the units upside down and wait a minute, and ice releases easily. You can use thumbs to press if you’re in a hurry. The lids are brilliant—they keep the ice flavored like water for iced water and tea. Most people with a chronic disease need to take medications throughout the day and eating a small snack is often required to prevent stomach injury from meds. Dark chocolate snacks can provide incentive to take the dreaded meds and get some antioxidants at the same time. I have used this big fat nail buffer for years to smooth out nails because I can’t hold a traditional nail file. It’s lightweight, cheap, and a perfect little gift from stockings to Easter baskets. I’m sure you know people with chronic illness need to have fluids with them to stay hydrated or take meds. These stainless steel bottles keep liquid hot or ice cold for hours. Not bulky or heavy. No tricky lid mechanisms to clean. Designs to suit anyone. I’ve bought a couple of these for gifts and they are loved. I was skeptical, but seeing is believing. Since my RA / RD became full blown, I haven’t been able to do my nails—I can’t straighten my fingers or hold the brush still. But, no one can tell how messy I apply this sheer nail treatment. And it has helped my nails grow to even lengths. The Butter London one comes in six natural sheer shades to complement different skin tones. Perfect save your hands tool. I can’t believe I lived so many years without this. There’s no easier safer way to slice fresh bagels. Mine is white, but online you can get other colors too. A friend gave me a couple of these, but I’d given up jewelry when my RD got bad 12 years ago. Lightweight earrings are the most I can manage. Finally, a friend attached the magnetic clasp when I wanted to wear it on a trip. How fun to be able to—easily—wear a necklace! These genius clasps come in various colors and designs. Get someone a book about their diagnosis that doesn’t dismiss it away. For people with RD, there’s my new book Rheumatoid Arthritis Unmasked. There are great supportive books on living with chronic illness like Chronic Resilience and How to Live Well. 1. Dry shampoo can be a lifesaver for folks who can’t wash their hair frequently. This one smells great and contains healthy ingredients. Plus it comes in various colors to match dark or light hair. 2. Supportive mugs, bumper stickers, clothing… that says you “get it.” The RAW Zazzle store is great for people with RD, but there are many other options for other diagnoses. Both hands are often needed to hold a knife—or worse yet, often only one hand is usable. With an adaptive cutting board, stainless steel spikes hold food in place for cutting. Corner guards help keep food on the board, and 4 suction cups anchor board itself in place. 4. Shoe gift certificate. You can get a gift certificate for almost anything these days—definitely for shoe stores or at Amazon to help a loved one get some more comfy shoes. I had to buy all new shoes after being diagnosed—that’s one more pain with RD. I have numerous pairs of these, and they make a huge difference. Celeste Stein has endless designs to suit any personality. Mild compression helps reduce swelling and promote circulation everyday. Higher compression versions are good for travel, but are also harder to get on & off. I need help to put on / take off moderate & high compression socks. ADD TO THE LIST! WHAT ARE THE BEST GIFTS YOU’VE BEEN GIVEN OR THAT YOU’VE GIVEN? 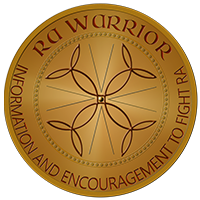 Check out the original RA Warrior gift guide: 21 Gifts for People with Rheumatoid Arthritis that includes ideas for homemade gifts and gift certificates. ← A Plateau in RA Treatment Progress? This is an awesome list. I definitely need a few of these for myself. I have chronic pain from fibromyalgia and Sjogren’s syndrome. Very good write up. Merry Christmas to you Kelly. Am reading your book. Thanks for giving us a voice. Blessings to you and your family this Christmas season. Keep up the good fight. Appreciate so much all your information . Merry Christmas, Kelly! I posted with you about a month ago, but I just realized that I was actually posting the chatty “Christmas letter” that I no longer write because so few people get it and, frankly, I hurt and I’m tired and there are more rewarding things to invest my resources on—like making gingerbread biscotti for my grandson! Thanks for giving me an outlet and sharing advice and inspiration among the community! Thank you for taking care of me! Your web site is a gift that I have passed to others. I always know where I can go to get the truth. May you and Roo be blessed at Christmas and into the New Year. Excellent list! I too would like many of these things. Thank you for this, Kelly. 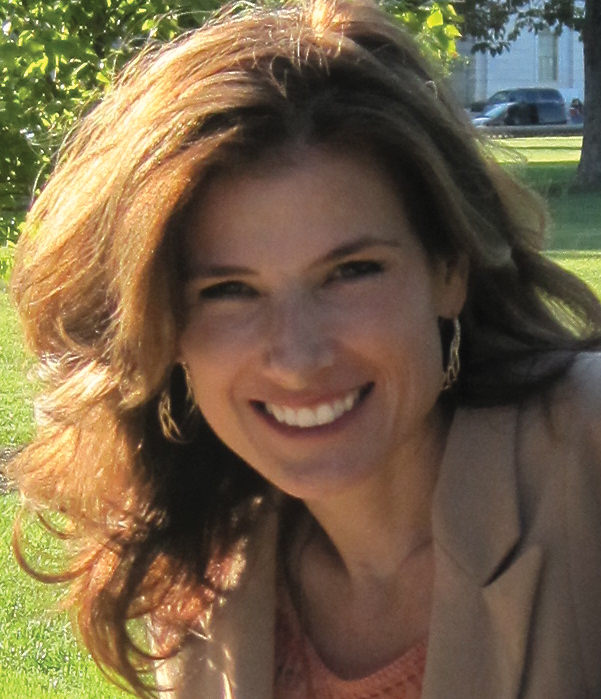 I know there is always reliable, helpful information on your website.